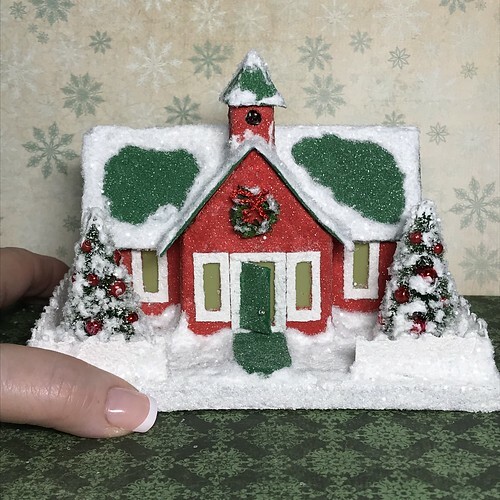 I haven’t made a Putz schoolhouse before, so I looked online for some inspiration. I found a picture of the Kelley Historical Museum Schoolhouse. I based my Putz on the design of that schoolhouse. 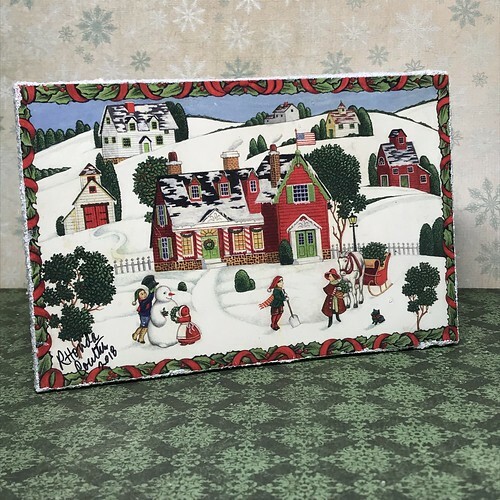 The base is 6 1/4″ wide and 4 1/4″ deep. The Putz is 4 1/2″ tall as measured from the bottom of the base to the top of the bell tower. 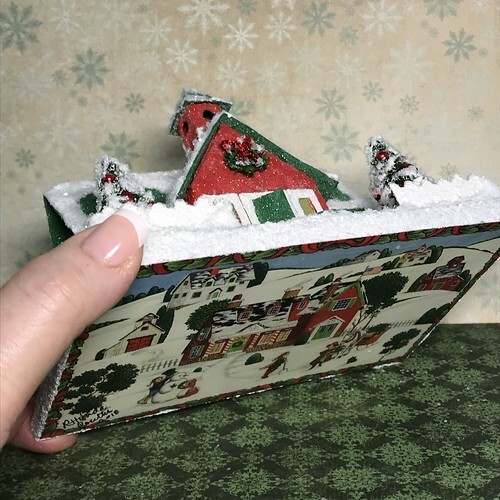 I use upcycled Christmas cards to make the bases for my Putz buildings. It was harder than I thought it would be to find a card with kids playing for the schoolhouse. This one works well. 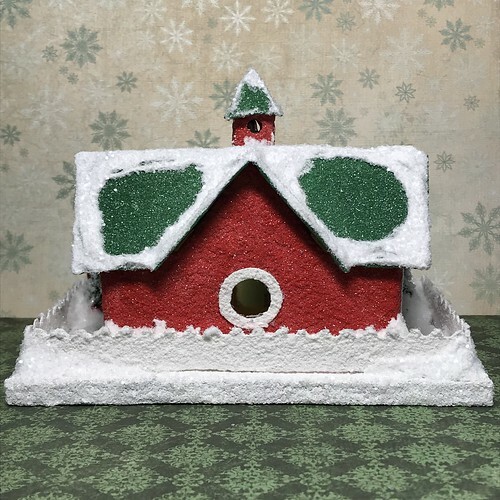 The house in the picture is the right colors for the schoolhouse. By the way, I am always happy to receive donations of more cards, both holiday and otherwise! I don’t use any personal information on the card in the use of my crafts. I made the wreath on the front of the schoolhouse from an evergreen chenille stem that I trimmed down to make it thinner. 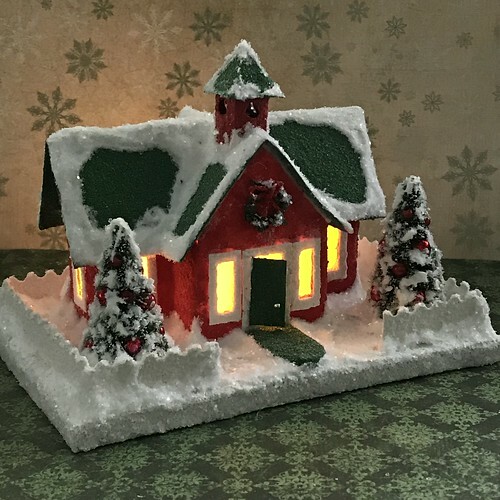 The back includes the traditional hole for the use of tiny LED lights to light the schoolhouse. So sweet when lights are added! All proceeds from my Etsy shop benefit Kenya Mercy Ministries. They work with the urban poor of Nairobi, Kenya, particularly the children and their families who live in Kibera, the largest urban slum in Africa. Thank you for your part in helping these children when you purchase items from my shop! 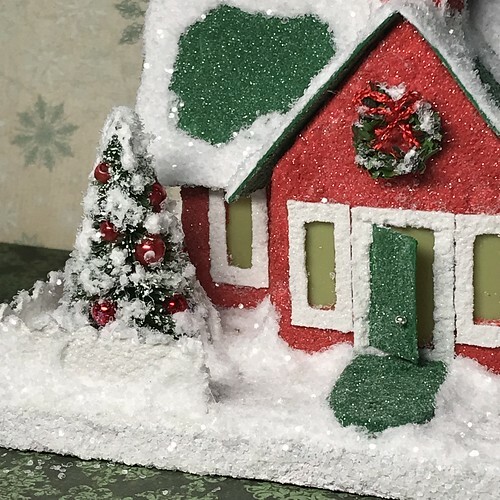 This entry was written by ~~Rhonda, posted on September 17, 2018 at 1:48 pm, filed under Putz / glitter houses. Bookmark the permalink. Follow any comments here with the RSS feed for this post. Post a comment or leave a trackback: Trackback URL.